It’s on again in 2020. We are again off to Bali for 6 days – 6 nights. We’ll farewell Winter and celebrate the arrival of Spring with an invigorating all-inclusive yoga retreat in northern Bali. Staying up in the hilltops at Abasan Mountain Retreat, we’re away from the hustle and bustle of tourism shopping and bars, stepping into a more authentic Bali. We will explore creativity, self purpose, passion and joy with an ongoing creative project. Some of us will love it others will find it challenging, but we will all have fun and a shared experience. Also taking timeout to trek to the local village and through tropical forest to spend time relaxing by waterfalls, immersing into the environment. With daily morning and evening sessions of yoga and or qigong, dance, breath and stillness we’ll deepen our practices to connect more fully with the sensations of the body, enliven our creativity, enjoy silence to gather personal insights, awareness of the mind and our own unique spirit. With 6 days away you are truly given the time and supportive practices to connect to your authentic self, refresh and energise! Not to mention making fabulous connections with others on the similar journey. One day will be given over to seva, as we continue our connection with the Gaia Oasis scholarships and the Tejakula Water Program. We will give back to the community who have served us. It is with thanks we take these opportunities to contribute. Watching traditional Balinese dance we’ll connect on a deeper level with Bali’s culture, its gentle people and customs. The retreats costs $1350 twin share or $1600 single for the six days-six nights, including accommodation, yoga access, all meals, touring and 1 transfer in each direction. Flights and insurance aren’t included within this price. It will be your responsibility to raise $200 min to fund the seva. DO NOT WAIT THIS WILL BOOK OUT. 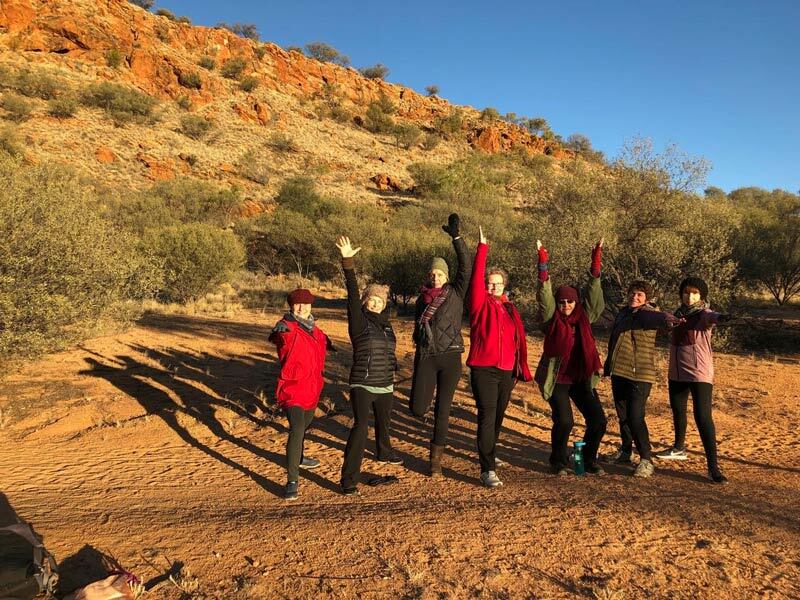 I am so grateful to have had the opportunity to be part of the retreat to Alice Springs 2018. Thanks Michelle for your generosity, insightfulness and for guiding us so beautifully.The planning seemed faultless as well as intuitive from start to finish. It was a gentle introduction to place when we arrived, seeing the sun setting over Alice – Mpartwe from the hilltop opposite our hotel, then up early the next day to the first of our seven days sunrise yoga. I loved the standing poses. I loved the walk in silence. The process opened my body to the crisp moment of sunrise and quickly developed my balance, strength and stamina. After hearty breakfasts we found ourselves diving into connection with land and place and people via Mali and Lorna, our generous Aboriginal aunties. They sat with us in their place, showed us how to listen to trees drinking, the wind choosing where to send the smoke, the land speaking of its origins through the stories of the people and the plants giving up their leaves to help us all in our lives. The visits to the Gorges and local places were supported by the Lorna and Mali connection too with accompanying stories and understandings that we couldn’t have gained without their input and your connection to them. Then the story of those connections between you and the people in Alice were also part of a big learning and profoundly changed my sense of the indigenous people in Alice and the surrounding communities. It was fabulous to go and to see what has been created at the Purple House. It was fantastic to have the attention of Sarah to explain how this amazing enterprise came into being. I loved that our travels took us to amazing landscapes where we walked and explored and then ate beautiful food, did Qigong and relaxation, laughed a lot. I was completely blown away by the colour of the earth and sky and no less by the wonderful group of women. So glad we sniffed the air together, hugged the big trees together, watched from our sleeping bags as the the huge shooting star sliced downwards from the milky way! Thank-you for your capacity to lead us into such complete immersion for body mind and soul and for making this an unforgettable experience. 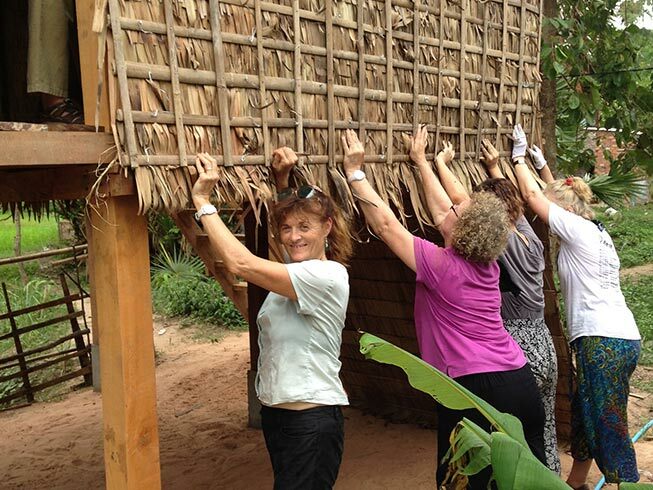 Read the story of our 2015 retreat to Cambodia written by Jesse Graham. Congratulations Michelle on a fabulous Vitality Moves Yoga retreat. The combination of yoga, meditation and joyful Nia, the cultural activities and community engagement made this a very special and worthwhile trip. Excellent value for money. You were a great facilitator. A beautifully designed and executed experience that has left me enlightened, enriched and refreshed… gratitude Namaste. Part of the philosophy of Vitalitymoves is Seva. Seva is a service that is performed without any expectation of result or award for performing it. Such services can be performed to benefit other human beings or society. Over the last 4 years the retreat participants have contributed $30,000 to community organisations in Cambodia and Bali. Giving funds to provide toilets in a village, sewing machines – allowing women injured from war to make an independent living, wheel chairs for landmine survivors, a years supply of baby formula for disadvantaged babies, building a simple house for a young family, providing water pipes to bring clean mountain water down to a village and giving to local schools.